« Want $30,000 to Earn Your Master’s Degree for FREE? 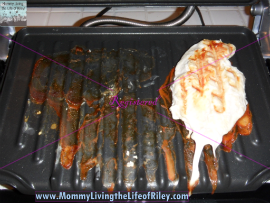 Of course, preparation is key in determining how healthy any food really is and so I was very glad to have the opportunity to try out the George Foreman Evolve Grill. Maybe I am one of the few people on this planet who hasn't used a George Foreman grill in the past, and so I was intrigued at how this grill would work. Does it live up to the hype? Keep reading to find out! 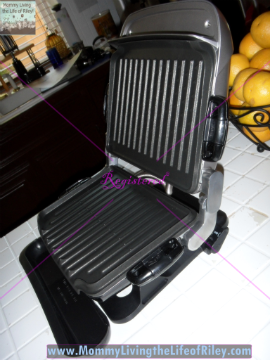 I reviewed the George Foreman Evolve Grillfrom George Foreman Healthy Cooking, which retails for $129.99. The Evolve grill has gone one step further and is designed with interchangeable grill inserts, which can be changed depending on what you want to cook, and can even be cleaned IN THE DISHWASHER! Now in my opinion, there is nothing worse than cleaning a grease-laden pan after dinner and so this easy cleaning option really went a long way with me. As you can see in the picture below, the Evolve grill came with two grilling plates (like a conventional George Foreman grill) along with a deep dish pan and a burger slider insert. I believe that you are supposed to get a muffin pan with the Evolve grill, but for some reason, I received the burger slider insert instead. You can also purchase additional plates for your Evolve grill, such as the waffle plate. The George Foreman Evolve Grill came with two spatulas, a burger slider insert and tool, two grill plates and a deep dish plate. 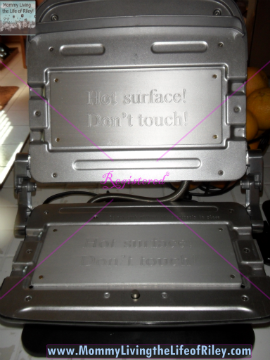 It also came with the grill itself, instruction booklet and drip tray. If you look at the lower left picture, this is what the Evolve Grill looks like without any plates attached. To attach a plate, simply slide the levers on the side handles of the plate open and they snap right on the grill. I decided to grill some chicken breasts for dinner and so used the two standard grilling plates. I liked how the top grilling plate is designed to leave a criss-cross pattern on the top of your meat. If you notice in the lower right picture, there is a lever on the side of the Evolve Grill which allows the bottom half of your grill to either sit flat or slant, depending on what you are cooking. If you are cooking meat, then you should slant the grill. Otherwise, if you are cooking muffins or lasagna, then you want your grill to be perfectly level. 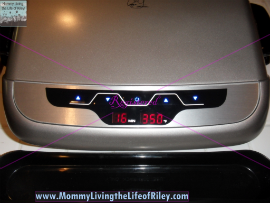 I liked the overall appearance of the Evolve Grill, for it has a stainless steel-ish exterior and digital display. It is recommended to let your grill preheat for 5 minutes and so I added 5 minutes to the 11 minute suggested cooking time for chicken breasts. 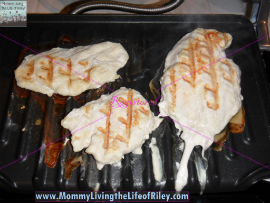 The lower right picture shows the chicken breasts uncooked on the grill right as I turned it on. In just sixteen minutes, our chicken should be cooked to perfection! Well, not exactly. The lower left picture shows our chicken breasts after the sixteen minutes were up. I admittedly didn't use a meat thermometer, but by appearance alone, these breasts looked WAY undercooked. I did like seeing all of the grease that was running down the plates into the drip pan, but I was disappointed that after following their suggested cooking time, the chicken was not close to ready. If you look at the bottom right picture, this is what the chicken breast looked like after cooking it for an additional 10 minutes. It doesn't look much different, right? I was very surprised that the chicken didn't brown at all. I finally cut it open and discovered that these breasts were cooked to death and very dry. Apparently, it should be mandatory to use a meat thermometer when using the George Foreman Evolve Grill, for you will NOT be able to tell whether the meat is cooked or not by appearance alone. I was planning on cooking my homemade macaroni and cheese in the deep dish pan, but have to admit that I wasn't very impressed with the Evolve Grill and didn't have high hopes that the macaroni and cheese would come out cooked evenly. 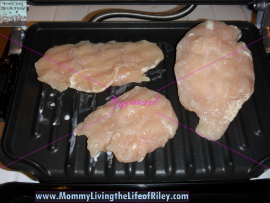 I liked that the George Foreman Evolve Grill did remove a lot of the fat and grease from my chicken breasts, but I didn't like the fact that they didn't brown and that you had to use a meat thermometer to keep from overcooking them. The grilling plates were a breeze to clean, however, and the fact that you could just pop them in the dishwasher after they cooled down was WONDERFUL! 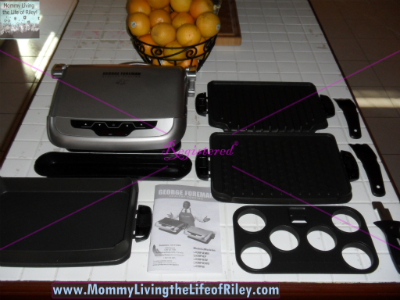 Disclosure: I received the George Foreman Evolve Grill from George Foreman Healthy Cooking and Family Review Network in order to facilitate my review. No other compensation was received. This product review is based on my own personal experiences with this item and is completely honest and objective. I just came across this because I am thinking of buying an “Evolve” after enjoying my old Foreman Grill for the last 15 years. You really DO need to preheat it and then add the chicken instead of just adding preheat time. If you placed a cold chicken breast on the unit it takes longer to heat up. Also it makes the meat “mushy” and will not have that nice crispy (with grill lines) outside. This is the same for oven cooking and any other type of grill cooking. Preheating I think is the key. Try it and see if it helps. Cheers!